This recipe is adapted quite heavily from one in a Japanese cookbook, _Saisai Sweets_ (Vegetable Sweets), by the wonderful Yumiko Kano, who I have mentioned previously. The original recipe called for soy milk, but I've used silken tofu instead for a richer, thicker consistency. I've omitted other things like rum-soaked raisins, and upped the maple syrup for more sweetness. This will make a pudding or a crustless pie that is about 10 inches / 28cm or so in diameter, enough for 6 to 8 servings (though I've seen one disappear in one person recently). I've given weight measurements rather than cup measurements, because the proportion of squash to tofu is what's the most important thing here. Scale up or down according to your needs. If you are doing this for Thanksgiving, cook the squash ahead of time - up to 2-3 days in advance. To cook the red kuri squash, either: cut in half and scoop out the seeds and fluffy bits in the middle. Poke several holes in the skin side with the point of your knife. Lay cut side down in a baking dish filled with about 1/2 inch / 1 cm of water. Bake at 350° F / 180° C until soft - a skewer poked through the skin side should go through easily. Drain away any left over water. Alternate method in a pan: de-seed, de-fluffy bit and cut up the squash into about 1 inch / 2cm chunks. Put in a very heavy pan (such as a cast iron enamel one) with enough water to come up to about 1/2 of the squash chunks. Simmer, lid on, until the chunks are tender; drain away any excess water. If you are using butternut squash, which has a much harder skin than red kuri squash, bake in the oven cut in half as above until tender. Cool the squash after cooking to about room temperature. Store, tightly covered, in the refrigerator. Put the cooked squash (skin and all if you are using red kuri squash - see notes), tofu, oil, salt, miso and maple syrup into the bowl of a food processor with the steel chopping blade. Process until totally smooth - you may need to scrape down the sides of the bowl a few times. Taste at this point, and see if you want to add more maple syrup (but remember you will be drizzling more syrup on top later). In the meantime, peel and core two medium eating apples. (I used Cox's Orange. You want a sweet, eating apple, not a hard, sour cooking apple here. Golden Delicious is a universally available type that will work fine here.) Slice into thin wedges, and toss into some acidulated water (water with a little lemon juice in it) to stop the slices from turning brown. Drain well and pat dry with a clean kitchen towel. 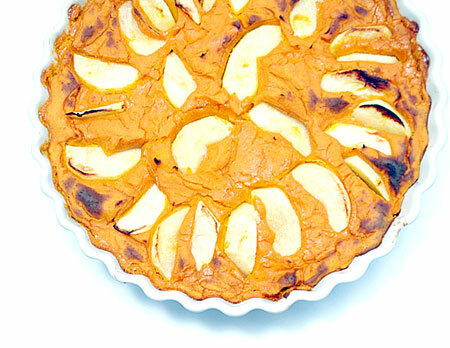 Fill the tart or pie dish with the pumpkin cream. Arrange the apples in a nice pattern on the cream, pushing down each slice a bit (they will sink a little, but this is a very dense cream.) Drizzle the top with more maple syrup. Alternatively, sprinkle with maple sugar if you have it. Bake for about 30 minutes, until the top is lightly browned. This pudding, or crustless pie, is great warm, at room temperature or chilled. If you don't have real maple syrup, try a flavorful clear runny honey instead. If you can't get a hold of kuri squash, you can substitute another squash, preferably a kabocha type, that is denser and sweeter than most other types. Try butternut squash, rouge d'Etampes or Muscat (Musque de Provence). Do not use regular pumpkin - it is far too watery and fibrous. 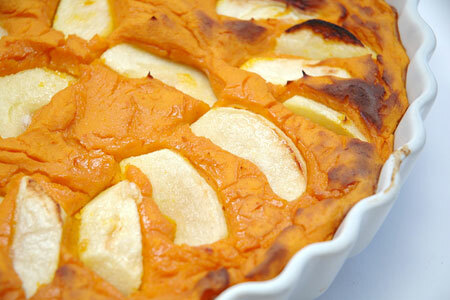 The orange skin of the kuri squash cooks up quite soft, and the orange adds to the vibrant color of the pudding. If using other, more tough-skinned squash varieties, or you have a green-skinned variety and want to keep the pudding orange-colored just scoop out the flesh and discard the skin. If you don't care about keeping it all vegan, use butter instead of the oil. Dot the top with more butter, for a really rich flavor. Try ripe pears instead of apples. Submitted by maki on 2013-11-12 20:33.
do u think yams (like red/purple/white) will work as well? 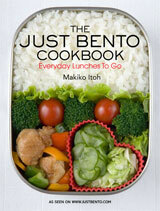 Maki, this sounds delicious. I'll try making it this weekend. I like that it uses tofu.. I'm not vegan, but used to be and I've made many (bad & good) tofu cream pies! I absolutely love your blog (actually, both blogs he he). I like everything related with Japan, including the food, and it's quite difficult to find good blogs which I can understand :) Congrats for the magnificent work!! I made this for thanksgiving and it was superb! I couldn't find kabocha or kuri squash but did get a buttercup squash which was new to me, and very good. I think I will try a hubbard squash next time. My mom, who doesn't like tofu loved it! Thank you for sharing this recipe! I made this for a late Thanksgiving dinner last night - it was awesome! Everyone really enjoyed it, this will definitely be making more appearances this Christmas. Oh! that looks wonderful! How I always love your blog! I made this to take for Thanksgiving with butternut squash since it's the most commonly available variety here in Kansas. Delicious! I just didn't tell my family that tofu and miso were included in the ingredients. Thanks so much for the recipe! yum, looks like a wonderful rustic, healthy dish! Just saying thank you for this recipe. It's been a winter standby of mine since it first appeared on the site, and has always been a hit, no matter who I serve it to. I made a version earlier this week with half the maple syrup, and my spouse and I have been eating it for breakfast all week. the recipe looks delicious!but i don´t have any tofu at home and can´t get anyone XP how much soymilk do I need for this recipe? This looks so delicious and simple to make! Wish I'd found it in time for Thanksgiving. It'll certainly be making an appearance on my random other celebration table soon! This looks delicious! I'm usually the one responsible for the sweet potato dish at Thanksgiving and I think this may be a great alternative to my tried-and-true recipe. Quick question: my cousin is allergic to soy, so is there an alternative to tofu? You mention soymilk is in the original version of the recipe you adapted -- could I use another alternative milk, or would it be too watery? I'm super soy intolerant, I was planning on trying it with cashews instead. You can make cashew cream by throwing raw cashews in a blender with some water, no need to strain like you would if you were making almond milk. I think the ratio is about 1 cup cashews to 4 cups water, but you can make it thicker or thinner -- I was probably going to try 1:1 cashews:water and go from there to approximate the silken tofu texture. I'm hoping the miso isn't enough soy to make me gassy, it sounds so delicious with it. You can try a little apple cider vinegar (maybe a couple teaspoons) if you're going totally soy-free. It won't give you the same flavor at all, but it will make the flavor seem more "full." I use it when I'm leaving out cheese or some other umami-rich ingredient. Ohhh tofu & miso in a dessert? I may (definitely) have to try this for Thanksgiving and report back. One of my favorite dishes my mom makes is a kabocha and pork stir-fry. Never attempted any sweet dishes with it though! It just so happens I grew Kuri squash this year in my garden; I'm so looking forward to do this in the next few days. I have a serious craving for Asian food and especially Japanese food... all the time. This is exciting. Thank you! You'll get no argument from me about various modes of vegetarian eating. I always enjoy your blog and love Japanese food. Many foods by their nature are vegetarian. But as one that has spent years in clinical laboratory, in medical microbiology, including in food safety, I do have to say that the faddish concept of veganism, overreaches reality. Most people are unaware of the degree to which clean water and food safety issues are completely taken for granted by modern foodies and cult sectors such as 'vegans'. Animal proteins are used to that ensure water, ice, and other consumables including produce and prepared canned foods, are free of coliform contamination. Sounds great! I was looking for a hearty vegetable side dish to serve for Thanksgiving; this should be perfect. And it was. I used butternut squash and cut down the amount of maple syrup slightly (started with half, tasted, and ended up adding another quarter). It was the perfect side dish. Not too heavy, but rich enough that we didn't miss the mashed potatoes. It’s really a delicious vegetarian dish. You give here simple and easy steps to prepare this our self. The combination of apple and kuri kabocha squash is the main secret ingredients which taste a verity than other vegetarian puddings. Keep more posts!